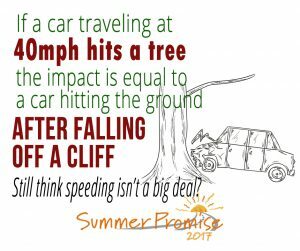 Over the past five years, teen drivers were involved in nearly 14,000 fatal crashes and more than 4,200 of those crashes involved speeding. According to a new AAA survey of driving instructors, speeding is one of the top three mistakes teens make when learning to drive. With 65 percent of those instructors also reporting that parents today are worse at preparing their teens to drive compared to a decade ago, AAA cautions parents that their involvement is key to preventing deadly mistakes behind the wheel. For every one mile per hour a car is moving, it travels 1.46 feet per second! Traveling at a speed of just 40 miles per hour, your car will move nearly 118 feet in two seconds. The average response time for adults is 1.5 seconds. This totals 206.5 feet traveled before you could step on the brake or take evasive action in an emergency! Is speeding really worth it? Think again next time you consider it. Speeding is one of the top three reasons for fatal crashes involving 16-year-old drivers. Teen drivers who are involved in a crash are usually at fault. A teen passenger has a higher risk of death when a 16-year-old is driving than when anyone else is. A fatal crash is more likely to occur when there are three or more people in a vehicle. Elderly drivers are more dangerous than teen drivers. It's always safer to travel at the same speed as other vehicles even if they are going over the speed limit.